Don’t panic on seeing the Dijkstra’s 3-way Partitioning in the graph, we’ll be discussing it soon. As you can expect, the Dual-Pivot worked pretty faster than the rest due to the O(n log3 n) complexity of Dual Pivot partitioning. 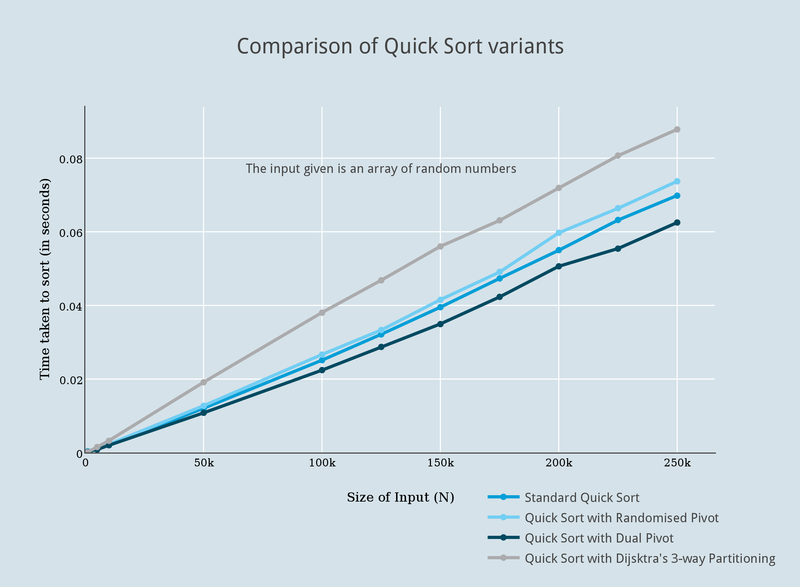 You might get a doubt, if dual partitioning gave an O(n log3 n) complexity, will an n-partitioning quick sort give O(n logn n) complexity which is O(n). Can we really achieve a linear time complexity algorithm for Quick Sort ? Well, it is a nice question, but remember that, when we were doing a dual pivot partitioning, we had the two pivots in sorted order. Because it was only two elements we didn’t actually do any sorting there. So, if you wanted an n-pivot partitioning in Quick Sort, you can do that, but you’d have to have elements in the sorted order, which is nothing but sorting the elements itself. You see ? O(n) complexity sounded awesome a few moments back, but now it sounds like nonsense because we know it wont happen !